LWML Women Bless Those We Serve! Many thanks to Chyeral, Jan, and Gloria (pictured), and 70+ Lutheran Women Missionary League (LWML) women from the Owatonna Conference of the LWML (Lutheran Women Missionary League) for your support of The Dwelling Place! On September 15th, Monica Groves, our mission advancement director, visited their Conference Rally in Albert Lea and shared about The Dwelling Place. At the rally, this wonderful group of women donated much-needed items. Their generosity encourages us and blesses the women and children we serve! Thank you ladies! Gloria and Candi came from Owatonna to deliver basic need supplies for our homes from the Faribault district of the LWML (Lutheran Women Missionary League). During a visit to Esther's Place, they were able to see the work that has been done and joined us in writing scripture assurances on the floor boards. 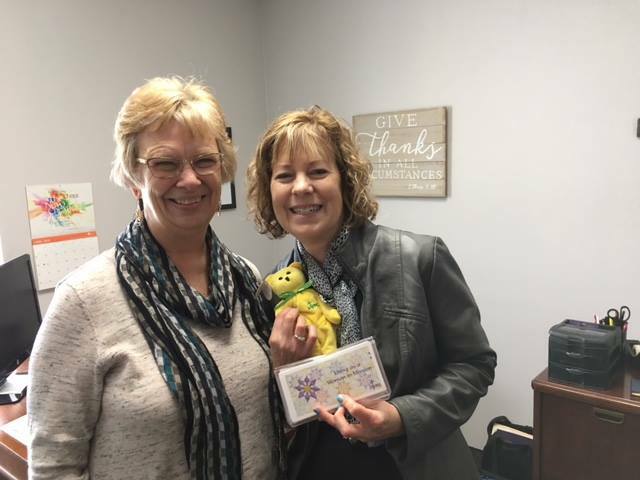 On April 18th, Deb Vinkemeier (LWML) and our Executive Director, Linda Wiza, met at the office before heading over to see the progress at Esther's Place. We are so grateful for the support and encouragement provided by the Lutheran Women Missionary League members! A lovely luncheon was held after the meeting. Second from the left is our new mission advancement director, Monica Groves. Our executive director, Linda Wiza, and new mission advancement director, Monica Groves, presented at the Lutheran Women's Missionary League Waseca Zone Spring Rally on Saturday, April 9 at First Lutheran Church in Waldorf, MN. What a blessed morning of fellowship with some of our women and children's most loyal supporters. Thank you, LWML ladies, for the handsome quilts, practical gifts, and cash donations! They will make a wonderful difference in the lives of our women and children. Thank you, you encourage and lift all of us!